I just adopted the most adorable white parakeet and named him Pépito (named after some chocolate cookies in France when I was growing up called Pépito, they were cookies covered with milk chocolate and all the kids were going crazy for them)…so Pépito must have flown away from a cage somewhere and ended up on my stairs, good thing I found him….because he could have been the happy breakfast of the neighbor’s cat! So here it is, Pépito has been adopted. I was reading that those little birds need a quite balanced diet, not only made out of seeds but also with vegetables, fruits, greens and other type of food humans eat. He eats from my hands now, and sits on my finger, but he is still afraid, if I move to quickly, he freaks out and flies away. So I happily got up this morning and prepared him a nice mixture of honey, corn flakes, cinnamon, peach, sesame seeds and millet…he stared at it for a while but did not touch it. I tried to made him accustomed to that mixture but nothing worked, so I gave up and was trying to find on the web what do those birds like, other than millet seeds. It seems like they love a bunch of mixtures, but apparently not mine. So in the middle of my parakeet menu thoughts, I decided to make something for my tea time, and went for those green tea bouchées. Bouchée means morsel, those are so small that they can fit in any size mouth. I will share them with Pépito, if he ever decide to stick his beak in there, but I doubt it. I don’t know why I am not crazy for green tea as a drink, I know it’s full of anti-oxydants but I its bitter flavor in the drink bothers me, but I love green tea flavor in desserts. Matcha green tea has been quite popular in France recently, probably because Japanese cuisine has been on the top of the trend for restaurants. Paris has tons of them now (something never thought of 10 years ago) and even Nancy my home town which is a town of about 300,000 inhabitants has three of them! the French are not too keen on raw fish, so I am stunned they’re starting to go crazy for Japanese food. Those bouchées are great with a cup of strawberries and cream, with some mint tea, or just as is. They’re easy to prepare and to bake, overall time is 25 min! Cut butter in pieces and melt butter slowly in a small pan. Do not melt until the butter turns brown. 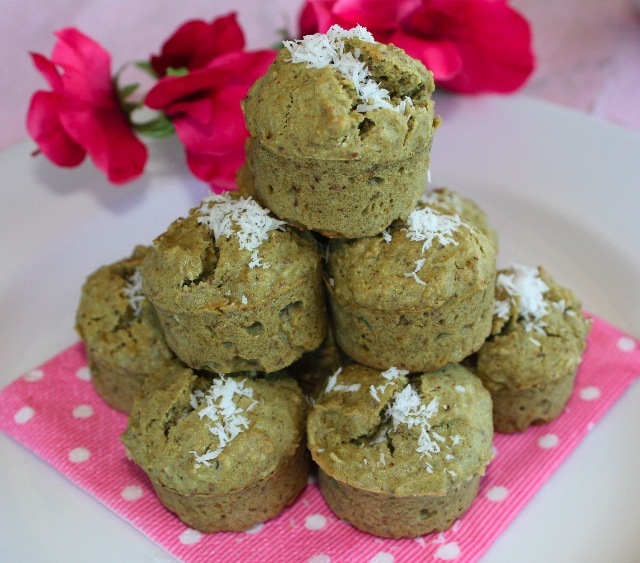 In one container, mix flour, sugar, green tea powder, almond powder, coconut powder and baking powder. Mix well. Incorporate egg and egg white. Add butter and mix the batter to obtain an homogenous paste. Place in individual mini molds (I used silicon molds, that I can’t get enough of) and bake for about 15 minutes, check to see if they’re cooked around that time and continue baking if they’re not cooked in the middle. This entry was posted by silvia on August 26, 2009 at 11:20 pm, and is filed under Breakfast/Brunch, Desserts. Follow any responses to this post through RSS 2.0.You can leave a response or trackback from your own site. I love the tea and coconut combo, this will be great with my mint tea. Wow ! Yummy ! minus the coconut would be good for tea. Yes, you can change the ingredients, the beauty of food, is that you can take an idea and change some ingredients if you don’t like them! Very nice of you to adopt Pepito. Parakeets are lovely and very smart birds. Just be patient and let Pepito eat millets while getting over the major shock of being lost and adjusting to a new home. Its best to leave him alone and talk to him a lot from a distance until he gets used to all this. Over time you will have a special bond with each other. Good luck! P.S. : Brilliant combination for the bouchées. Pépito is so pretty! Thanks for putting up a photo. 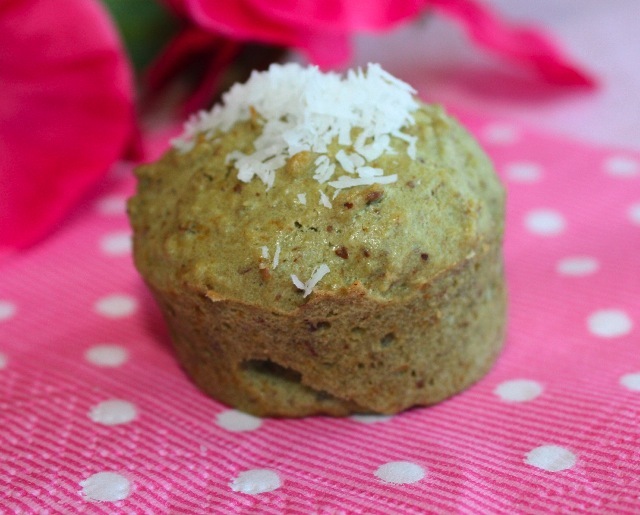 I grew up on green tea (several varieties really) and know I’d love this recipe – although I’d probably eat all of them at once since they look irresistible! Ahaha, you’re funny! Thanks, he is a cute birdie, I hope he is happy in his bigger cage w/ lots of toys. Funny how green tea never manage to be sweet no matter how much sugar you add to it. I don’t add sugar to the drink, but even in desserts, it does not absorb the sugar. So if people like the sweet feeling, they might need to add extra sugar. I don’t like desserts that are too sweet, so I tend to “under” sweeten everything. If you grew up on green tea, you must be the expert! Ooh, these look yummy! I didn’t like matcha for a long time, but when I worked in a Starbucks I tried a green tea frappuccino, which is a creamy frozen blended drink with green tea powder and melon-flavor syrup, and now I love matcha! I think the coconut with these was a great idea. Pépito is a very pretty bird. When I was a child, I had a pet parakeet. He would bob his head up and down and “dance” if I played him a bit of music. 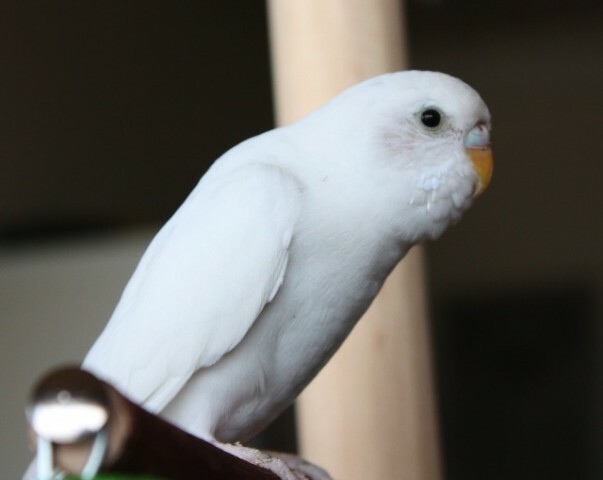 Parakeets are lovely pets, and it was so nice of you to adopt one! Those would be perfect with a cup of tea or espresso. @Healthy Tasty Cheap Thanks for your message. I am curious and really interested what people have to say about parakeets. Yes with green tea, either you love it or hate it. I like it w/ coconut, I think those two mix well together. Pépito is still scared. This morning, a huge falcon or maybe eagle (not sure which one) came on the balcony, since he saw Pepito in his cage and wanted to get him. That bird was not even scared of me, and the poor Pépito completely went crazy. I know kids love parakeets! bouchees look really nice, btw. will definitely try the recipee! wow that is terrible. I am learning how to take care of a bird, since it’s all new to me, but Pepito is so small that he would not last long w/ predators out there. Helene, you’re back! nice to see you around again. If you want a parakeet, better to get a young one, easier to train.